This past weekend I had the pleasure of creating a lily of the valley bridal bouquet and it was magnificent. Due to the delicate nature of the blooms I was using, I reverted back to the use of a bouquet holder. For many years all of my bouquets have been natural stem bouquets. However when I first became a wedding designer the use of a bouquet holder was most common. My flower shop girls nearly fell over when they saw me bring out a bouquet holder. Thankfully the bouquet holder has come a long way since I first started designing 20 years ago. This holder had a pretty silver handle. Many people still remember the dreaded white plastic holder, but a holder allows the flowers to have a constant water source. The bouquet holders are also super helpful when you are creating a cascade. Another option would be to wire all of the stems but I wanted the flowers to have a constant water source. I used a full bundle of lily of the valley, lots of white lilac, sweat pea, white freesia, and white ranunculus to create this bouquet. I was really pleased with the final outcome, although I will admit using a bouquet holder is as close to surgery as I ever want to get. Imagine inserting over a hundred stems into that little holder. Luckily for me my friend photographer Vicki Grafton just happened to stop by. 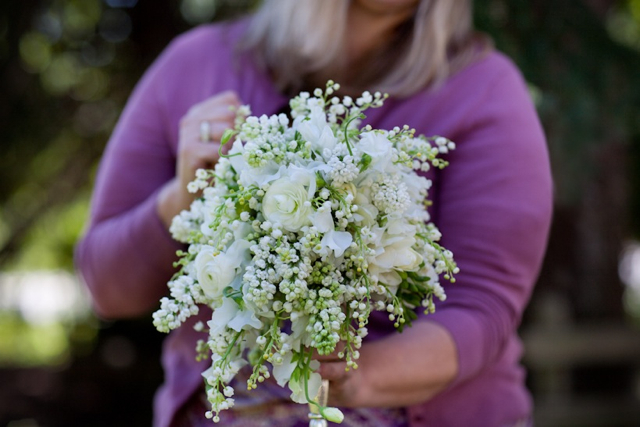 Because of her we have this pretty picture of my amazing lily of the valley bouquet!! That bouquet is one of my all time favorites. Can’t wait to see professional pictures of the wedding with the bride holding that stunner. Oh, I’m trying to imagine the smell of that bouquet! It is just gorgeous. I couldn’t help but put in a comment about this fantastic bouquet. I think lily of the valley is the most beautiful flower ever! Of course the fragrance doesn’t hurt either:-) I guess because it is not always available is what makes it so special. Beautiful design Holly. literally this bouquet caught my breath when I saw it! SO lovely well done, it will be one that makes my heart sing! That is truly beautiful, one of my favourite flowers. It is quite easy to imagien the lovely scent.